This indicator has all of the important features you need. However, you can't set an individual color for each pattern and alerts don't work in the MT4 version. It's expensive compared to other premium indicators of its kind. However, no other indicators that I've tested come close to the accuracy of this one. The indicator is very straight forward and easy to use. Even the activation process is easy. You get one key. No need to generate a new key for each trading account. I initially had trouble activating the indicator (more on this later). Everyone involved was very helpful. They even remotely accessed my computer to solve the problem. ​Summary: Nison Candle Scanner (NCS) is an indicator for the Ninja Trader, Trade Navigator, and Trade Station platforms. There is also a version of the indicator called the Nison Candle Highlighter (NCH) which is available for the MetaTrader 4 and eSignal platforms. This indicator accurately highlights 28 of Steve Nison's favorite candlestick patterns. NCS has the added ability to scan for patterns and alert you when new patterns develop. Steve Nison is the father of Japanese candlestick trading in the West. We literally have candlesticks on our charting platforms in the West because of the efforts of Steve Nison. I've seen others claiming to be the authority on candlestick trading, but Steve Nison is the real deal. That being said, this indicator highlights candlestick patterns according to Steve's own specifications, so you know that it's accurate. $49 Monthly or $495 for Lifetime Access (NCH)! Is Nison Candle Highlighter or Nison Candle Scanner Right for You? I wasn't originally intending to write a Nison Candle Highlighter or Nison Candle Scanner review. My intention was to write an article about a good free candlestick pattern indicator for MT4. However, after testing a ton of the free indicators, not being satisfied with any of them, looking for more free indicators, finding outdated indicators and trying to updated them, etc., I had hit a brick wall. None of the free indicators that I had tested were good enough to recommend to you guys, so I decided to look at a few premium indicators. That's when I remembered that Steve Nison developed a candlestick pattern indicator a few years back called the Nison Candle Scanner. The MetaTrader 4 version (which I tested) is actually called the Nison Candle Highlighter. Nison Candle Scanner (NCS) is available for Ninja Trader, Trade Navigator, and Trade Station. It highlights candlestick patterns, it can scan for patterns, and it can alert you when new patterns form. Nison Candle Highlighter (NCH) is available for MetaTrader 4 and eSignal and does not have the ability to alert or scan for patterns. On the plus side, the lower functionality of NCH comes with a significantly reduced price tag. I tested the Nison Candle Highlighter for a while. I had it for a month although I only really got to use it for about two weeks (more on that later). It was a huge improvement over the free indicators that I had been testing. The Nison Candle Highlighter (and I assume the Nison Candle Scanner) works exactly the way you would expect it to. I can definitely recommend it, but it's not cheap, so you'll have to decide if you actually need it and if it's worth the price to you. Is Nison Candle Scanner or Nison Candle Highlighter Right for You? The price of Nison Candle Highlighter and especially Nison Candle Scanner will prevent many of you from giving this excellent indicator a try. For others, it will be well worth the price to basically have Steve Nison looking over your shoulder, teaching you candlestick patterns. When I first started using the Top Dog Trading method, I purchased Barry's indicators too. They were very useful in helping me identify good trading setups in the beginning, so I know some of you will find Steve Nison's candlestick pattern software useful as well. What Works and What Would I Change? The Nison Candle Highlighter that I tested worked very well compared to the other indicators that I had tested. However, it's not perfect, so let's go over some of the pros and cons. ​Steve Nison is the father of Japanese candlestick trading in the West, so you know a candlestick pattern indicator that operates based on his own specifications will be accurate. In fact, the Nison Candle Highlighter is far more accurate than any other candlestick pattern indicator that I've tested so far. Not only does it highlight candlestick patterns correctly, it highlights them in the correct context of the market. As you can see from the image above, this indicator highlights bullish reversal patterns after bearish price movements and bearish reversal patterns after bullish price movements. This is key for accuracy when trading candlestick patterns. All of the other candlestick pattern indicators that I tested had trouble highlighting the patterns within the correct context of the market. The Nison Candle Highlighter and Nison Candle Scanner allow you to select whether or not to highlight each of the 28 candlestick patterns individually. In my tests, I rated these indicators on how accurate they were in highlighting the strong reversal patterns, so this feature was very useful. You can also see a feature to allow alerts in the image above. However, alerts do not work with the MetaTrader 4 and eSignal version of this indicator. In fact, the sales page specifically mentions that, so I'm not sure why the option is there. Maybe it's a vestige of a previous function that is not longer supported. Either way, they could easily add basic MT4 alerts and they don't have them. I was a bit surprised by that, but I never use alerts anyway so it's not a big deal to me. Another thing that you can see from the image above is that the indicator gives you the ability to set custom colors for long or short candlestick patterns. However, you cannot set a custom color for neutral patterns. In the image above, you can see the neutral patterns highlighted in a yellow color. Since that color can't be changed, those labels could be difficult to read with certain background colors. Another feature that I would like to see (which may not be important to you) is the ability to set a separate custom color for each individual pattern. Some of the other indicators that I tested were capable of that, and I can see that being useful to some traders. ​Another cool feature of the Nison Candle Highlighter and Nison Candle Scanner is the ability to use either full or abbreviated levels. The image below shows the full labels. ​I really prefer to use the abbreviated labels because it keeps the chart looking less cluttered. However, it's nice to have the option to switch back and forth when you're learning. None of the other indicators that I tested had the ability to choose. Most used full labels. A few used abbreviated labels (although none of the abbreviation systems were as elegant as NCH or NCS). Note: There is a legend for the abbreviations on the sales page for Nison Candle Highlighter and Nison Candle Scanner. You could print out or reference this legend if you ever need help to determine what a certain abbreviation represents. That way you wouldn't need to switch back and forth between full and abbreviated labels. However, I found the abbreviation system to be fairly easy to understand, e.g., -E = bearish engulfing, +E = bullish engulfing, -S = shooting star, +H = hammer, etc. ​In the image below, all 28 candlestick patterns are enabled (although not all are represented in this section of the chart). As you can see, even with all of the candlestick patterns enabled, the chart is still relatively clean looking. 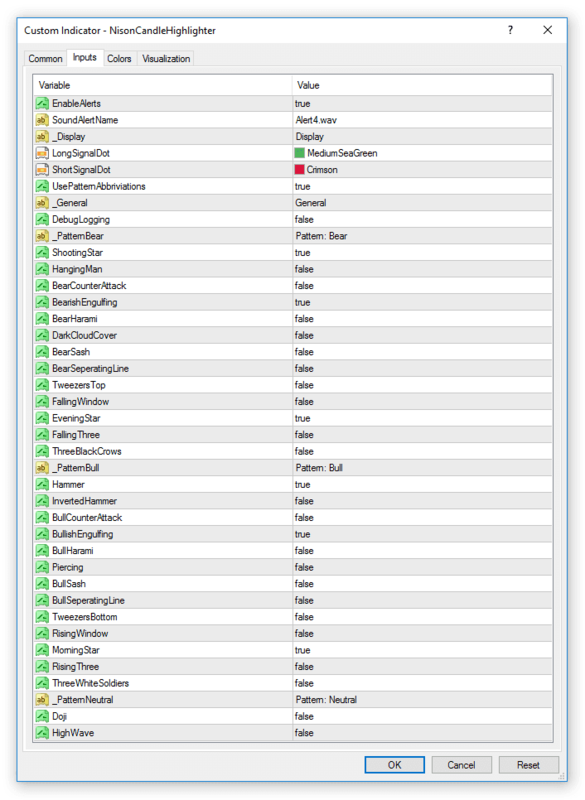 Of course, it would look completely different if I had selected full labels for this image. Although the chart below may look messy to you, it's a huge improvement over the other indicators that I tested. Many of the other indicators that I tested did not allow for abbreviated labels. Nearly all of the other indicators that I tested crowded the candlestick wick with their labels. As you can imagine, the crowding labels make it difficult to see the absolute highs or lows of the wicks. They also make it difficult to accurately use the measuring tool. I've been trading candlestick patterns for nearly 6 years. Using candlestick patterns as entry signals is one of my favorite trading techniques. However, I never trade candlestick patterns on their own. Instead, I like to combine them with other trading techniques and look for a confluence of signals. My favorite way to trade candlesticks is to combine the strong reversal patterns with regular MACD divergence. In the image above, you can see several examples of this. In total, there were 4 candlestick patterns that would have been good entry triggers into these divergence trades. Of those 4, only 1 of them would not have earned at least a 2:1 reward to risk ratio. As I mentioned earlier, I was only able to test the Nison Candle Highlighter for a couple of weeks instead of a month. That's because I had trouble activating it on my desktop PC. The guys at CandleCharts.com went out of their way to help me get it running. The main tech support guy, Syl, even remotely viewed my PC to make sure that I wasn't making some kind of mistake during installation. He worked on the problem, trying many different things, for about an hour. When he was unable to resolve the issue, he got their programmer to do the same thing. These guys spent hours altogether trying to get this figured out for me. ​Finally, I went out and bought a laptop. I had been meaning to get one anyway. Nison Candle Highlighter installed right away on the new laptop. I think I have an idea of why there was a problem. I rebuilt my PC a couple of years back and used the same hard drive. When I boot the system, the first screen says that I'm using an American Microtrends motherboard. However, my new motherboard is an ASUS so there's obviously a problem. What Are Other People Saying About NCH and NCS? So far in my Nison Candle Highlighter / Nison Candle Scanner review, I've explained that Steve Nison's indicator is more accurate than any of the other candlestick pattern indicators that I've tried, which is the most important thing. I've shown you some features that I like about Steve's indicator as well as some ways that I think it could be improved. I also told you about how hard their support staff worked on my behalf. Now that you know what I think about the Nison Candle Highlighter / Nison Candle Scanner indicator, let's take a look at what some of Steve's other customers are saying about it. 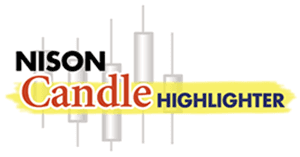 Summary: The Nison Candle Highlighter and Nison Candle Scanner indicators can help you accurately identify 28 of Steve Nison's favorite candlestick patterns. This can be very useful to a trader who is just starting to discover the power of candlestick trading or even an experienced candlestick trader who would like to learn how to trade them according to Steve Nison's specifications. Although it isn't perfect, Steve's indicator is much more accurate than any other indicator that I've tested so far. The price may be a barrier to some, but I know that others will find the benefits well worth the price. $49 Monthly or $495 for Lifetime Access! once the pattern emerges – does it send an alert in form of an email / messages ? The Nison Candle Scanner (for NinjaTrader) can send alerts. The Nison Candle Highlighter (for MetaTrader 4) unfortunately does not send alerts. You should receive an email with all the information that you need. Be sure to check your SPAM folder if it doesn’t show up in your regular inbox. Does the scanner show the PA candle type during the candle’s development or does it do it after candle closes? There is a setting to allow it to label potential candlestick signals as they are forming (as long as they continue to meet the parameters needed). You can also change the setting to only label a candlestick signal once it is closed. Regardless of which setting you use for spotting the candlestick signals, you should never trade a candlestick signal that hasn’t closed, because candlesticks often change drastically during the last few minutes or even seconds before closing. You can pay for the MT4 version month-to-month for only $49 per month. If that’s too much money for you, you should probably think about investing in something other than the currency market. Don’t take that the wrong way. I don’t mean to be rude, but trading is an expensive business venture. If something helps you make money instead of losing it, it is well worth getting – especially at this price. Most tools related to trading are much more expensive. kudos for the great job you’re doing here. Could you please tell me the price of the NCH for MT4… as i perceive the $49 is for the scanner(NCS). That is if the highlighter is even different from the scanner. The MT4 version, Nison Candle Highlighter (NCH), doesn’t have a scanner feature due to the limitations of MT4. Consequently, NCH is the cheapest option at $49 monthly or $495 one-time purchase. That being said, the scanner isn’t really needed in the Forex market because you’ll likely only trade a handful of pairs at any given time. It’s easy enough to check your charts for the highlighted patterns, whereas stock market traders could really benefit from the scanner because there are just so many stocks to trade. Hey Chris, Thank you for your great reviews, the’re a great help in my decision process! I like the way you combine the NCH with the MACD and wait for divergence. Are the divergences drawn automatically on your charts? What indicator is that? Like to get that one too 🙂 Thanks! I’m glad I could help you, Christopher. Nice name, BTW! I don’t use a MACD that automatically draws the divergence. I did that with an image editor to illustrate the technique. I’ve used MACD indicators in the past that automatically drew divergence, but I didn’t like it because it drew divergence too often on price movements that I would not really consider as good divergence setups. It just ended up making the chart look cluttered, which is the opposite of what I need to make accurate and timely trading decisions. I’m not sure how much divergence trading you’ve done, but after a short time it becomes very easy to spot the divergence on your own anyway. If you prefer, you can use your trading platform’s drawing tools to mark them as well. I did that in the beginning. Edit: I would suggest using this MACD indicator, though, if you’re trading with MT4. The default indicator is not correct. It does not display the MACD indicator in the standard way. Right now, I’m about to go live with the TopDogTrading method. I went through the course the last couple of months, done my backtesting and if everything works out I should be up and running somewhere next week. Experiencing some technical problems at the moment, that security key for the TDT indicators is a pain (like you wrote in your review). Yeah… I wish they would change the security key process for the indicators, but at least they answer their emails fairly quickly. Good luck!